While many people are aware that pearls come in a wide variety of shapes and sizes, most assume that a pearl is a pearl. Seven Seas Pearls at this time only works with saltwater pearls. When it comes to saltwater pearls, there are three types of pearls: Akoya Pearls, South Sea Pearls and Tahitian Pearls. Each of these types of pearls come from a different oyster and are farmed in different parts of the world. When people traditionally think of pearls, many people assume that pearls are all round. While many pearls are round, they also come in gorgeous shapes such as baroque, semi-round, button, teardrop, and oval. One shape is not necessarily better than another – it is strictly preference. In this blog we are going to give you an overview of each type of pearl and would encourage you to read other parts of our blogs for more details about each type of pearl. Akoya Pearls are farmed in the waters off the coast of Japan. The temperature, tide and nutrients make this the perfect farming ground for these beauties. Akoya Pearls range in color from white, ivory, blue, silver – and have a multitude of overtones that pair with these base colors. 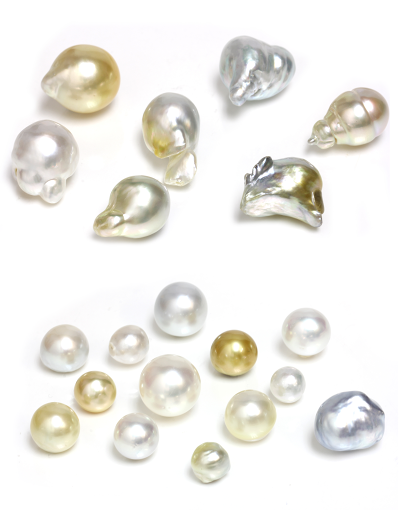 Akoya Pearls are the smallest in size of all the saltwater pearl varieties; typically they range from 2mm in size all the way up to 10mm in size. The most common size of Akoya Pearl is around 7mm. Akoya pearls are considered the “classic” type of pearls. Many women have at least one strand of Akoya pearls in their collection. Akoya pearls can be dressed up – or down depending on the occasion. Because of their size, Akoya Pearls typically are less exaggerated in the more unusual shapes in comparison to South Sea and Tahitian Pearls. 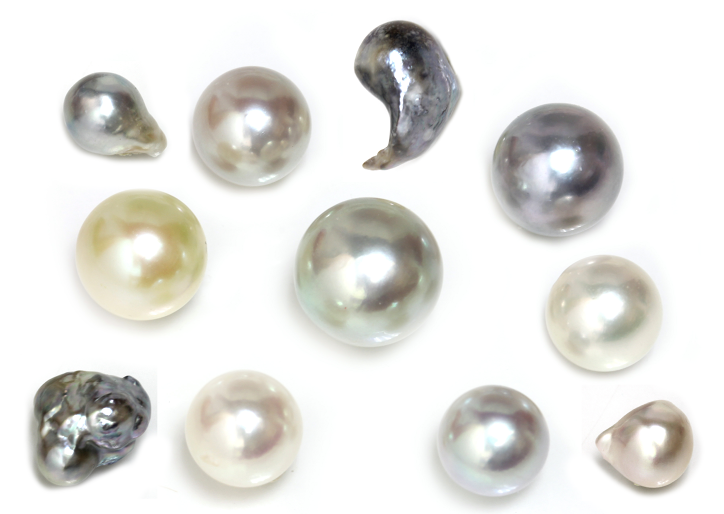 Akoya Pearls are typically found in round, semi-round and baroque shapes. Tahitian Pearls are farmed in the waters of the French Polynesia (think Tahiti). Tahitian Pearls are found in the black lipped oyster and grow best in the shallow nutrient rich beds called atolls. Tahitian Pearls have magnificent spectrum of colors ranging from black, gray, green, purple, peacock, chocolate and eggplant. For each one of these base colors are dozens of overtones that give Tahitian Pearls a very complex color palette. Tahitian Pearls typically range in size from 8mm (on the small side) and can be found as large as 20mm. Any Tahitian Pearl that is less than 9mm in size tends to be classified as small Tahitian Pearls whereas anything larger than 13mm is considered large and rarer. Typically, Tahitian Pearl necklaces range from 10mm to 13mm in size. Because of the incredible size and color range, Tahitian Pearls have incredible shapes ranging from round, semi-round, baroque, button and teardrop. Of the saltwater pearl variety South Sea Pearls are by far the largest. South Sea Pearls as their name would suggest are farmed in the South Sea (near Australia). South Sea Pearls come in a beautiful range of white, ivory, cream, champagne, gold, and blue. As with other types of saltwater pearls, South Sea Pearls also have stunning overtones that when paired with the base color creates absolutely stunning shades. South Sea Pearls range in size from 8mm (the smallest) all the way up to 25mm– which are incredibly rare. The average size of South Sea Pearls is 15mm. Because these pearls are so large in size, they come in gorgeous abstract and exaggerated baroque, teardrop, round and semi round shapes. This entry was posted in Shapes and Colors and tagged Akoya Pearls, baroque akoyas, Bridal Jewelry, los angeles showroom, pearl grading, Pearl Information, Pearl Jewelry, Pearl Luster, South Sea Pearls, Tahitian Pearls by sevenseaspearls. Bookmark the permalink.